Last week, the Census Bureau released a report that points to some major barriers that, if left uncorrected, could lead to a massive undercount of Asian Americans. This undercount, in turn, would have severe consequences for Asian American communities, as well as governments, businesses, and nonprofit service providers. The implications of the study are very clear: public and private investments in Asian American census outreach need to be significantly ramped up, particularly in states and metropolitan areas with sizeable and growing Asian populations. The 2020 Census Barriers, Attitudes, and Motivators Study (CBAMS) Survey was conducted between February and April 2018, and the Census Bureau reported results in January 2019. The following data points are based on a survey of over 17,000 respondents, including over 11,453 White respondents, 2,272 Hispanic respondents, 1,845 Black respondents, and 1,023 Asian Americans. There are many troubling findings about perceptions and barriers related to Census 2020 among communities of color, with problems most acute for Asian American respondents. When asked “How likely would you be to fill out the census form?,” Asian Americans were the least likely of any racial group to report that they intended to complete the form. 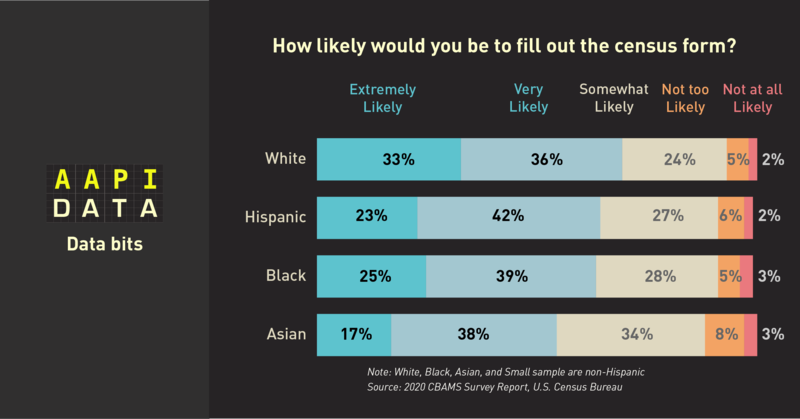 Only 55% of Asian Americans said they were “extremely” or “very” likely to fill out the Census form, compared to 69% of Whites, and 65% of Latinos, and 64% of Blacks. Asian Americans were also the least likely to express familiarity with the census. 38% of Asian Americans said that they were either “not too familiar” or “not at all familiar” with the Census. This compares to 30% among Hispanics, 20% among Blacks, and 19% among Whites. 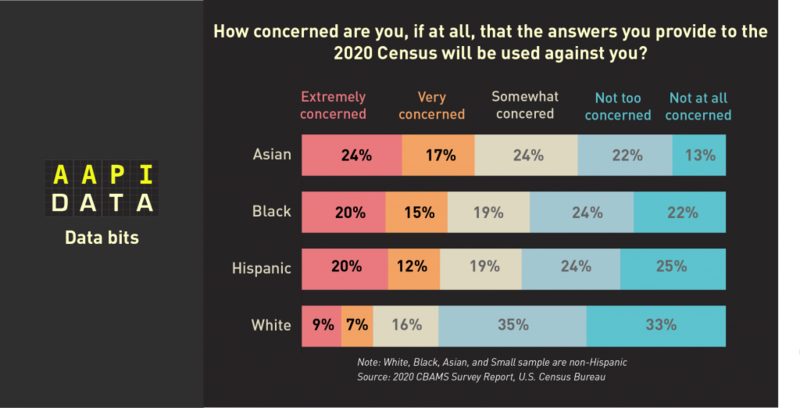 Asian Americans are the group most likely to say that their answers to the Census “will be used against them.” An astonishing 41% of Asian Americans expressed this concern versus, for example, just 16% of Whites. Blacks and Latinos also expressed relatively high levels of concern that their answers would be used against them (35% and 32%, respectively). Asian Americans also were among the most skeptical of all racial groups in terms of whether or not they believed that the census information would benefit them personally (53% for Asian Americans, compared to 57% for Whites, 66% for Hispanics, and 69% for Blacks; see page 52 of the report). Why are Asian Americans Currently the Least Likely to Participate? There are several potential reasons for why Asian Americans are among the least likely to say they intend to participate in Census 2020. General distrust of the federal government, however, is not one of them. The same report indicated that Asian Americans have the highest levels of trust in the Federal government (page 48). Socioeconomic barriers are also less acute for Asian Americans than for other communities of color. Immigrant status is a very likely explanation: Not only are Asian Americans the only racial group in the United States that is majority foreign-born, they are also disproportionately represented among immigrants who have arrived in the United States after 2010 (37% for Asian Americans versus 31% for Hispanics). These immigrants have not had any prior experience with the decennial Census, and likely need much more education and outreach than those who arrived prior to 2010. Limited English proficiency also bears a strong relationship to whether people intend to participate, according to the Census Bureau report. This is a significant issue for Asian Americans, who are the racial group with the highest language barriers, as 35% speak English “less than very well.” Importantly, however, the CBAMS Survey was conducted only in English and Spanish. This means that the Census barriers for Asian Americans uncovered in the survey are likely much more severe than the survey results indicate. Education and outreach depend on significant public and private investments. However, only a few states have stepped up so far in making significant investments on Census outreach. California has invested $100 million so far; Maryland and Georgia are next with $5 million and $2.2 million, respectively. Notably, immigrant-heavy states like New York, Texas, and Florida have not yet invested in Census outreach, and states like Washington and Virginia have invested less than $500,000 each. Private philanthropy is also important for Census outreach, and there are promising signs of progress in states ranging from Michigan and Minnesota to California, New York, and Ohio. And yet, Asian American outreach has not yet received the kind of attention it needs. While much news coverage on Census 2020 has focused on the controversial citizenship question and its likely chilling effect on immigrant participation in Census, few have taken note of the fact that Asian Americans are the largest share of recent immigrants, or that Asian Americans have the highest rates of limited English proficiency. The implications of the 2019 Census Bureau report are clear: state and local governments, as well as corporate and nonprofit philanthropy, need to step up in a major way and increase investments in Asian American outreach. Such investments are critical to ensure adequate representation, accurate market intelligence, and effective delivery of public and private services for a community that is 20 million and rapidly growing. Karthick Ramakrishnan (@karthickr) is professor of public policy at UC Riverside and founder of AAPI Data. Janelle Wong (@ProfJanelleWong) is professor of Asian American studies at University of Maryland and is a senior researcher at AAPI Data. Who is winning the Asian American money race?